A giant lizard that is sadly no longer with us had four eyes, scientists reported this week in Current Biology. While the image of a four-foot-plus lizard blinking four eyes at us is evocative, it's also misleading. 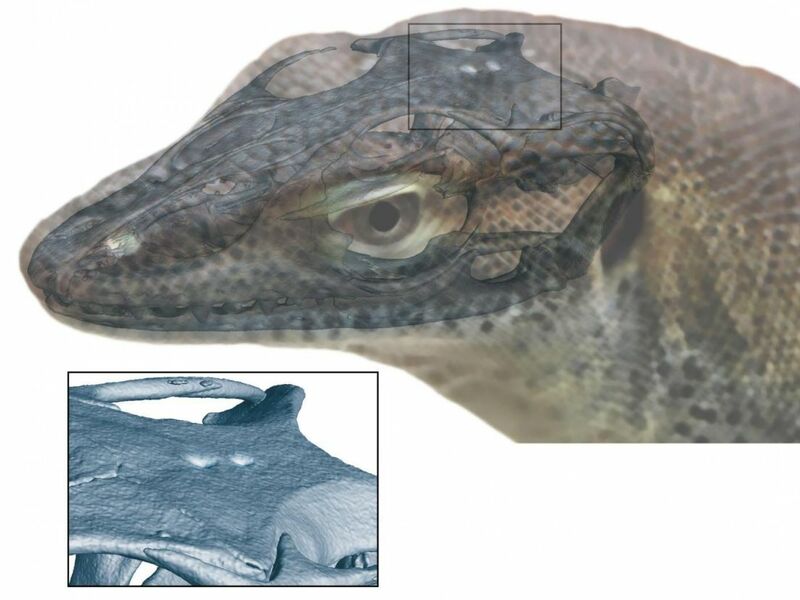 What the extinct monitor lizard Saniwa ensidens actually had was two normal lizardly eyes and two organs atop its head that can fairly be called eyes, as lead author Krister Smith of the Senckenberg Research Institute explained to Haaretz. The monitor was the only jawed vertebrate found so far that had four eyes, a characteristic confined today to a jawless fish – the lamprey. But plenty of other primitive animals had more than the regulation two eyes. Actually, three eyes are quite the norm in lizard circles, and was the norm in primitive vertebrates. 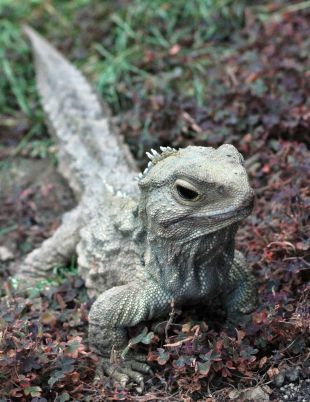 The tuatara of New Zealand is the most famous triple-eyed reptile around still living. That third eye is visible to us as a small, pale or translucent spot on the midline behind the eyes. The unpigmented skin allows light to pass through, Smith explains. The tuatara's third eye, which is smaller than the "usual" eyes but actually has a tiny lens and retina, regulates circadian rhythmicity and some hormones. Several other lizard family members also have distinct third eyes, including anoles. So do lampreys - yes, the fish. "This so-called third eye is smaller than the so-called 'lateral eyes' (the two we're familiar with as humans)," Smith says. Snakes and some other lizard lineages, like geckos, lost their third eye. That could be because they adopted subterranean or nocturnal habits, where little sunlight falls, or moved into the tropics, where there's little change in day-length through the year). Until now, the prevailing assumption among the lizard crowd was that the third eye in lepidosaurs (i.e., lizards) derived from the pineal organ (which is NOT the same thing as our pineal gland – the similar name is coincidence). Lepido-rebels thought the third eye might derive from the parapineal gland. And along came a monitor lizard around 1.3 meters long that lived 50 million years ago in Wyoming, with not one eye depression on the top of its skull, but two – space for a pineal eye, and a parapineal one. The long and short is that the team concluded that the third eye in lizards evolved independently from everybody else's third eye. Let us assume that the pineal organ and parapineal organ on the top of the monitor's head were photo-sensitive, like today's third eyes; and were probably involved in circadian and hormonal regulation too. But why call them eyes? During the baby monitor lizard's early development in the egg, the pineal and parapineal organs develop in precisely the same manner as the "regular" eyes, as outpocketings of the brain. (Your eyes developed the same way in utero, as outpocketing of the brain. Live with it.) It gets better. "When well developed, the pineal organ and parapineal organ form lens-like and retina-like layers separated by a fluid-filled space, just like the lateral eyes," Smith says. "They use many of the same photo-tranducing pathways. From an anatomical perspective, it's perfectly reasonable to call them eyes." The evolution of this whole eye business is quite unclear. We cannot say at this point that the four-eyed condition was the primitive condition for vertebrates, says Smith – precisely because it remains unclear what exactly developed into that third eye. The third eye was present in the early jawed vertebrates - reptiles, birds, and mammals, and fish. 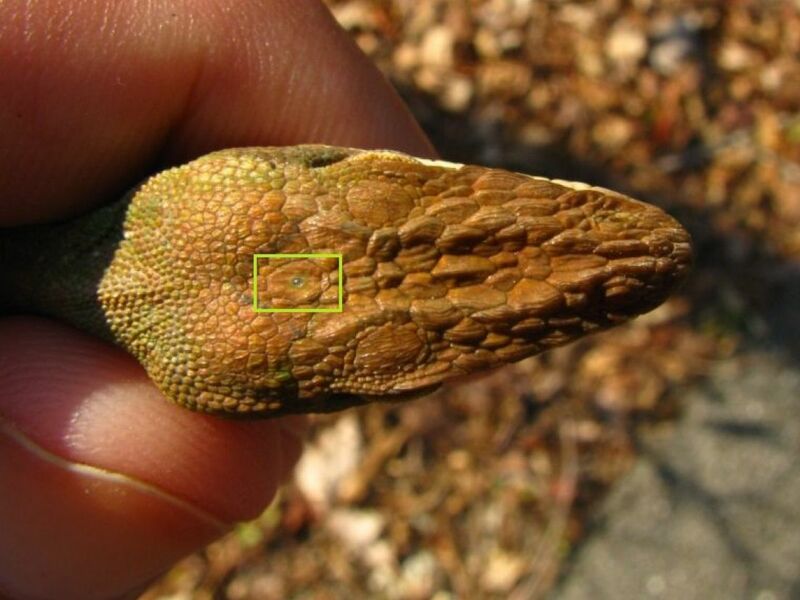 "On the one hand, there was this idea that the third eye was simply reduced independently in many different vertebrate groups such as mammals and birds, and is retained only in lizards among fully land-dwelling vertebrates," Smith says. "On the other hand, there was this idea that the lizard third eye developed from a different organ, called the parapineal, which is well developed in lampreys. These two ideas didn't really cohere." Indeed they do not, and then came the extinct giant lizard with the four eyes, birthing a paradigm shift. The discovery of the four-eyed beast, in which each the pineal and parapineal organs formed an eye on the top of the head, indicates that the third eye in lizards evolved separately, independently from the third eye of other jawed vertebrates, Smith explains. Aha. This is what people who care call the "lizard shift." "Note, however, that we can't constrain when this 'lizard shift' took place, because there is no third eye in any other living amniotes," Smith clarifies to Haaretz. "We can't determine whether the shift took place at the base of Amniota (jawed vertebrates), or Sauropsida, or was really just a weird lizard thing." We can't actually say what the third and fourth eyes achieved millions of years ago. "There is evidence that they can sense the polarization of light, specifically short-wavelength light, and use that information (together with an internal clock and the time-dependent pattern of polarization of the sky) to tell direction and orient themselves. Another proposed mechanism, called light-dependent magnetoreception, is also localized in the pineal organ of amphibians," he says. Monitor lizards seem to have originated in Asia, and colonized North America about 56 million years ago, Smith says. The one they found had lived in Wyoming, as lizards do, 49 million years ago. It went extinct 34 million years ago at the Eocene-Oligocene boundary. If it had lived, we could probably have seen these third and fourth eyes as small colorless patches of skin on the top of the huge lizards' heads, if we had been stupid enough to get that close. They were predators and could have seen us clearly with their lateral eyes, while using the dorsal ones to orient themselves geographically and launch the attack.